By trade I’m a seafarer, having spent the last number of years on ships from Ireland to Asia. As fate would have it, the first time I ever truly developed an interest in whiskey was onboard a ship smack in the middle of the Indian Ocean. That said, I’m far from the first sailor to have nurtured an affinity for the amber nectar. While seafaring has traditionally been more associated with rum, any strong spirit has been adopted in times of need to satiate the appetite of the thirsty sailor. A grog ration was served to members of the royal navy until 1970 which consisted of one part rum, three parts water issued twice daily. Fresh water, even in casks would not keep for long on board ship and from the earliest days alcohol was substituted. Brandy was the initial choice of spirit for the Royal Navy (where most of the traditions developed) until after the capture of Jamaica and the subsequent adoption of Rum. The daily ration at sea during the 18th was a pint of rum for a man and half a pint for a boy. With quantities like that it’s easy to see how sailors developed a reputation for drunkenness. Rum was easily distilled from sugar cane and as such was readily available throughout the Caribbean. Bilge Juice (US): Illegal alcoholic beverage created on long deployments by fermenting yeast, water and sugar. Car Smash: Brandy and champagne mixed in a cocktail. Fogram: Any poor quality wine, spirit or ale. Too much fogram would make one foggy or drunk. Gimlette: Gin and Lime juice. Navy surgeon Thomas Gimlette concocted this to try encourage mariners to drink more fruit juice and thus to avoid scurvy. Gorilla Snot: Bailey’s and crème de menthe mixed. Gnats piss: Any weak liquid e.g. weak tea or coffee, low alcohol beer or wine. Hanky- Panky: A mix of whiskey and ginger ale, guaranteed cure for colds! Rumfustian: A popular privateer’s hot drink blended from raw eggs, sugar, sherry, beer and gin. Toasting: In civilian tradition it is permissible to drink toasts in water rather than alcohol, but naval superstition presupposes death by drowning for the personage toasted. Likewise a glass that rings tolls the death of a sailor. One must stop the ring and the devil will take two soldiers in lieu of a sailor. 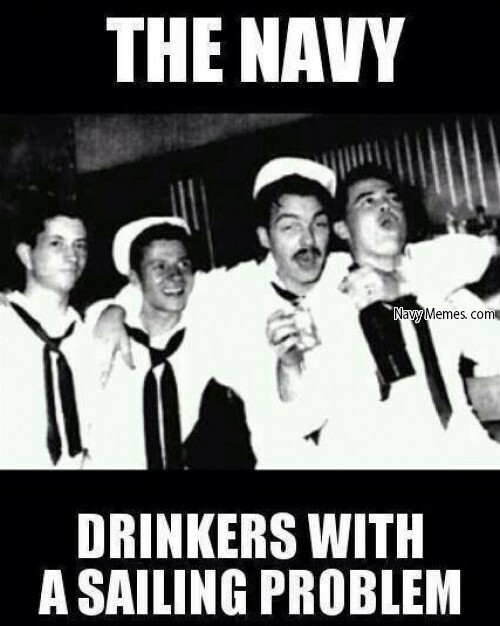 This explains why naval officers never clink glasses when drinking a toast and goes some way to illustrate inter-service rivalry! While one or two have made the transition to dry land, the unmistakable sea origins of some of these expressions speak volumes to their cultural and historical basis. One of the key defining features of cultures the world over is the nature of their speech patterns and the clues they give away about the culture itself. While I can’t say with certainty what exactly the above expressions confess about my own seafaring character, the inextricable link between alcohol and the sea has definitely continued with myself and many others. Long may it continue! Previous Post Why do dictators love Johnnie Walker? Next Post We’re all in this together!